Staying in this evening? 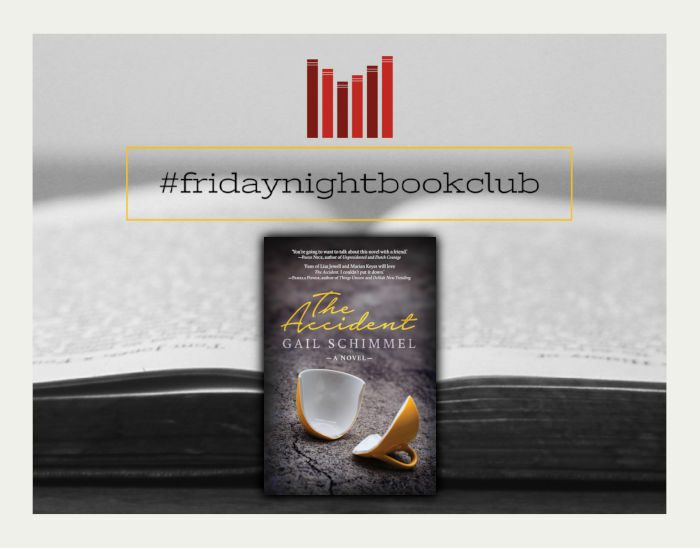 Settle in with a glass of wine and this excerpt from Gail Schimmel’s new novel The Accident. The Accident is the fourth novel from Gail Schimmel, following on from Marriage Vows (2008), Whatever Happened to the Cowley Twins? (2013) and The Park (2017). My mother isn’t curious about my news. She’s not like other mothers. When I phone and tell her I have big news, she doesn’t nag me, or beg me to tell her, or insist I come around immediately. I wasn’t exactly expecting her to. But I always have a small hope. My therapist thinks I subconsciously remember a time when she was different, and that this is the source of my hope. Everybody (including Jane, my therapist) insists that my mother is like she is because of The Accident. Everybody says it like that, like it has capital letters, even my mother. My life has been defined by something that happened to my parents when I was two, something I wasn’t even involved in. Maybe my mother was different before. When I was a child, I came up with the theory that she was a zombie. That she’d actually died in that stupid accident, but for some reason kept walking around like an alive person. ‘My mom’s actually a zombie,’ I told some of the girls at school. They didn’t believe me, so I invited them around to play. After that they still didn’t believe me, but they also didn’t not believe me. That’s how much like a zombie my mother was. And still is. Luckily, I was friends with the sort of girls who were very kind and who wouldn’t tease you even if your mother was a zombie. The sort of girls who went home and told their mothers how worried they were about me, with a zombie mother. Pippa Lee’s mom took me aside one day and gently told me that my mother was definitely not a zombie, just a bit sad. I nodded and said yes, I understood. And I allowed her to pull me to her large soft breasts and stroke my head, because it’s true that children of zombies are starved of physical affection. When I told Jane my childhood zombie theory, she thought it was psychologically very astute. Jane’s theory is that the reason I’m not more screwed-up is because I was a particularly astute little girl. My theory is that therapists have to say that to make you feel better. Making you feel better is a big part of their job description. As far as I’m concerned, I’m okay because I had an okay childhood. Yes, my mother is distant and cold – even her hands are cold to the touch – but she provided for me, and she was always around, and she came to all my school events, and she never hit me or even lost her temper with me. Even when I tried to make her. Even in my teens when I went out with unsuitable boys and came home late and drunk, and fought with her. She just stayed calm and told me she trusted me. People have much worse childhoods, I tell Jane. I have a lot to be grateful for. Jane says this is a very mature attitude, and I feel better about myself, and as I leave the waiting room I wonder if she has different compliments for all her patients, or if she just recycles the same ones. I don’t really care – children of zombies take their compliments where they can find them. So I’m disappointed but not surprised when my mother’s reaction to my announcement that I have news is to calmly arrange a visit two days from now. Maybe it would help if I met her?’ says Daniel. Daniel wants to meet my mom, and I don’t want him to – this has been an ongoing theme for the last two months. Ever since Daniel left his wife. ‘If she’s so calm, she’s not going to freak out about me,’ he goes on. The problem, of course, is that Daniel isn’t thinking ahead. He’s just left his wife of ten years and their child. He isn’t thinking about having a child with me, even though he knows that’s what I want. He isn’t thinking about what sort of mother I’ll be, or even what sort of stepmother. But if he meets my mom, he’s going to think about it. He’s going to wonder if I’ll become like her. He’s going to wonder if he’s done the wrong thing. Jane says I won’t become like my mother. She says she can absolutely guarantee it. She says I will screw up my children in entirely different ways. Jane has a lot to say about my relationship with Daniel, of course. She says I was attracted to him because he was unavailable, because that’s all I’ve ever known. She’s very worried that I won’t want him now that he’s left Claire. She’s especially worried because Daniel’s a very warm and effusive man. He’s always telling me how much he loves me and how excited he is about our lives together. Jane says I must be careful not to feel stifled. I tell her that’s not going to happen: I’m very pleased Daniel left Claire and is with me. I just don’t tell Jane how I creep out of his heavy arms at night because I’m worried I’ll suffocate. And I don’t tell anyone that in a strange way, my mother’s phlegmatic reactions – while constantly disappointing – are also strangely comforting because they are all I know. My mother is a zombie and my world is on its axis.